When you make an investment of this size, you need to have the utmost confidence in your technology vendors. We know from experience that Telecast equipment is highly reliable and backed up by first-rate support. HuskerVision, the A/V and broadcasting unit of the University of Nebraska Athletic Department, has installed fiber optic transport equipment from Telecast Fiber Systems, a Belden Brand (NYSE:BDC), as a key element in a $4.2-million high-definition (HD) upgrade of the HuskerVision master control and production facilities. Powered by the Telecast solutions, a state-of-the-art fiber optic network now links master control with the university’s Memorial Stadium and Bob Devaney Sports Center, giving HuskerVision centralized control of dazzling big-screen HD presentations for all home football and basketball games. Managed by systems integrator and Telecast Fiber Systems dealer Alpha Video, the HD upgrade of HuskerVision’s production facilities was completed to coincide with the start of the college football season. The HuskerVision master control center receives signals over the fiber network from more than 30 camera sites in Memorial Stadium and the Devaney Center, and then transmits the live and instant replay feeds to large-screen HD video displays at both venues. Video feeds are also transmitted to the HuskerVision production studios where they are used in a variety of team highlight sports programs and also handed off to national sports networks. The Panasonic SMPTE (Society of Motion Picture and Television Engineers) HD cameras are outfitted with Telecast CopperHead ™ camera-mounted fiber transceivers, and Telecast SMPTE Hybrid Elimination Devices (SHED™s) and HDX™ power adaptors enable the cameras to be remotely powered and centrally controlled. HuskerVision also uses Telecast’s Adder II ™ and Python II™ fiber optic transceivers for bi-directional transport of audio and intercom signals, and Viper II ™ terminal gear to facilitate both analog and HD-SDI signal transport. With the launch of HuskerVision in 1994, the University of Nebraska’s Memorial Stadium became the first college football stadium in the U.S. to feature big-screen instant replay boards. Today, HuskerVision productions originate from the Michael Grace Production Studio in Memorial Stadium, which was made possible by a generous donation from Lloyd and Katherine Wilson in honor of former football player and NU Foundation fund-raiser Michael Grace. HuskerVision boasts a broadcast quality high-definition facility including a control room, three editing suites, a digital asset management system, and a production studio. HuskerVision produces coaches’ shows for football, men’s and women’s basketball, volleyball, and baseball which air on local and national networks. Huskervision also produces highlight tapes for all 23 varsity sports. Over the past decade, more than 100,000 highlight tapes have been purchased by NU football fans. For more information, visit http://www.huskers.com . 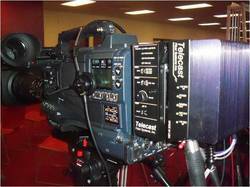 Telecast Fiber Systems, Inc. is a leader in portable and fixed fiber optic systems for television broadcast production. The company’s video, audio, and communications systems are used worldwide by TV networks, teleproduction companies, sports venues, and various private, educational, and government and military organizations to extend range, simplify cabling, and reduce labor costs and set-up time. Telecast systems accommodate all television production signals, including NTSC/PAL video, SDI and HD/SDI video, analog and AES/EBU audio, HD and triax camera interfaces, and intercom and data signals. Telecast Fiber Systems is a division of Belden (NYSE:BDC), a leader in comprehensive signal transmission solutions for fiber, cable, wireless signal, and industrial networking applications. More information can be found at http://www.telecast-fiber.com .